Governor Andrew M. Cuomo today announced that eight officers from the Port Authority Police Department were honored with the state Division of Criminal Justice Services' Lifesaving Award for their actions after a bomb was detonated in a subway corridor in midtown Manhattan on December 11, 2017. Lt. Miriam Rubio, Sgt. Hector Martinez, Sgt. Victor Talamini, Officer Jack Collins, Officer Anthony Manfredini, Officer Drew Preston, Officer Sean Gallagher, and Officer Anthony Estevez each were presented with the award during a ceremony this afternoon in Manhattan. DCJS Executive Deputy Commissioner Michael C. Green congratulates Lt. Miriam Rubio as, from left to right, Port Authority Police Department Deputy Chief Michael Brown and Chief of Operations Emilio Gonzalez and look on. The eight officers joined by Chiefs Gonzalez and Brown and Commissioner Green. "Amid chaos and panic, these eight officers fearlessly entered the blast area to help injured commuters and secure the suspect, bravely risking their own safety to protect the public" Governor Cuomo said. "It is an honor to recognize these officers for their heroic service that epitomizes the work of New York's first responders." The eight officers received the award from Michael C. Green, Executive Deputy Commissioner of the state Division of Criminal Justice Services, during a ceremony at the Port Authority Bus Terminal in Manhattan. Port Authority Police Department Chief of Operations Emilio Gonzalez also spoke at the ceremony. The bombing occurred on the morning of Dec. 11, 2017, in the underground east-west corridor that links the West 42nd Street 8th Avenue and 7th Avenue subway stations. An individual detonated a bomb that was strapped to his body, causing panicked commuters to flee the vicinity. Officer Manfredini, who was on patrol in the area, reported the incident, and then entered the smoke and debris-filled corridor along with Lt. Rubio, Sgt. Martinez, Sgt. Talamini, Officer Collins, Officer Gallagher, Officer Preston, and Officer Estevez. Upon arriving at the scene, the officers saw evidence of the explosion. The suspect, injured and bleeding, was lying on the corridor floor, surrounded by debris and with wires protruding from the area of his chest and waist. The officers retreated, but then took immediate action to prevent a possible second blast. They re-entered the corridor and approached the suspect with their firearms drawn. When the suspect tried to reach for a cellphone, the officers — knowing based on their training and experience the phone could be a detonator for another explosive device — moved the cellphone out of his reach, handcuffed the would-be suicide bomber and secured the scene for New York City Police Department Bomb Squad personnel, who were on their way to the scene. The suspect has since been convicted of federal terrorism charges and faces life in prison. The Lifesaving Award was created in 2016 by the state's Police Officer of the Year Award Selection Committee in response to the many nominations it receives involving police officers who performed heroic acts during life-threatening emergencies. Commissioner Green, who chairs the Police Officer of the Year Award Selection Committee, said, "What started as a regular morning for commuters in New York City quickly turned into panic and chaos. These officers no doubt saved countless lives and prevented further injury thanks to their quick-thinking and selfless acts of bravery. Their actions during this attack epitomize what this award is all about." Port Authority Executive Director Rick Cotton said, "Ensuring the safety and security of the traveling public is our top priority. These eight brave officers acted in the self-sacrificing tradition of the Port Authority Police Department, which lost 37 officers on September 11th. Vigilance and quick action are hallmarks of the agency's police officers, and today's recognition by the Governor and the state Division of Criminal Justice Services is a well-deserved tribute to the selfless actions of these officers." 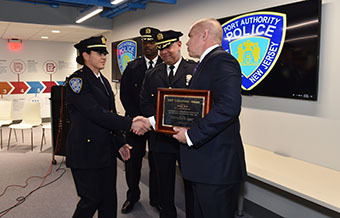 Port Authority Police Superintendent Edward Cetnar said, "These eight officers' swift actions demonstrated extraordinary bravery that resulted in no serious injuries and allowed the Port Authority Bus Terminal to be secured without further incident. They exemplify the finest traditions of pride, service and distinction that define the Port Authority Police Department and they've humbly accepted all the recognition they've received for their distinguished service." In addition to recognizing these eight officers, DCJS posthumously honored Trooper Joel R. Davis of the New York State Police with the 2017 Lifesaving Award for his role in responding to a violent domestic dispute in Jefferson County on July 9, 2017. When Trooper Davis arrived at the scene in the town of Theresa, he engaged a gunman as a woman and two children sought refuge in a nearby shed. During the incident, Trooper Davis was fatally shot. Trooper Davis' children accepted the award in their father's memory during a ceremony in October at the State Police's Watertown station, where troopers also unveiled a marker in his memory. More information on Trooper Davis' heroic efforts, which Governor Cuomo recognized in October, can be found here. The recipient or recipients of the Lifesaving Award are selected from nominations for the Police Officer of the Year Award, which recognizes a single police officer or team of officers for an exceptional act of valor. This year, that award was given to six members of the Yonkers Police Department who apprehended a gunman who had shot a detective in the face on September 25, 2017. The Police Officer of the Year Award has been presented since 1984.